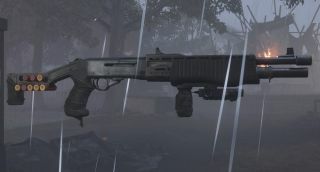 The Exotic Shotgun is called the Division 2 Sweet Dreams, because after you fire a few shells into your enemies faces, they're sleeping and not waking up. It's one of a few Division 2 Exotics in the game, and as you'd expect, Division 2 Sweet Dreams is one of the best shotguns available in The Division 2. Here's everything you need to know about how to get the Division 2 Sweet Dreams Exotic Shotgun. Sweet Dreams: Landing a melee attack on an enemy after swapping to this weapon grants 35% bonus armour and applies the Sandman debuff. Killing an enemy with the Sandman debuff reapplies this bonus armour. Sandman: This debuff prevents the enemy from using armour kits and from receiving healing from any source. Evasive: While equipped, dodging reloads 1% of your current weapon's magazine. Sweet Dreams is certainly a close range shotgun... not that there's any other types, really. Blast people in the face and punch them to deal insane damage, especially since you can prevent them from healing. It's not great if you like sitting back with a sniper, but if you can adjust your play style to favour Sweet Dreams then it can be a very useful weapon. Much like Merciless, obtaining Sweet Dreams is really a roll of the dice. You don't need to obtain parts to craft it; instead, you need to kill Outcast bosses and cross your fingers it drops as part of their loot. You can increase your chances of receiving Sweet Dreams by playing Outcast missions on Hard and Challenging difficulty but ultimately, it's going to be a roll of the dice. Some good Outcast missions to farm for Sweet Dreams include the Roosevelt Island stronghold and Potomac Event Center mission. Run these both a few times and kill the named Outcast bosses at the end, then cross your fingers one of them drops Sweet Dreams. When you've got it, why not search for the hunters holding the 12 Division 2 masks?